Ireland’s Shane Breen took the biggest win of his career and dashed Alberto Zorzi’s (ITA) hopes of a back-to-back Longines Global Champions Tour Grand Prix du Prince de Monaco Presented by Sapinda win, after a spectacular performance aboard Ipswich van de Wolfsakker tonight. Breen's win means he is the latest addition to the GC Playoffs, with a ticket to the elite line-up in the Longines Global Champions Tour Super Grand Prix which will take place in Prague this December. Under the patronage of HSH Prince Albert II of Monaco, the 9th leg of the Championship race is a long-standing and popular stop on the calendar, with illustrious names listed on the winners roster over the years. Breen finished just tenths of a second ahead of Zorzi and Fair Light van T Heike with Denis Lynch (IRL) and RMF Bella Baloubet taking third. Crowds lined the edge of the arena, including passionate fans of the sport and new visitors who had never witnessed show jumping before but were delighted to see the world’s top riders and horses in such a breathtaking venue. Members of Royal Families from around the world, including H.E. Sheikh Joaan bin Hamad Al Thani, H.E. Sheikha Al Mayassa bint Hamad bin Khalifa Al Thani and Prince Talal of Jordan taking their seats for a feast of top show jumping. Bill and Melinda Gates with ringside seats were clearly absorbed in the highest level of show jumping in which their daughter Jennifer competes. The family cheered on Jennifer’s trainer Harrie Smolders (NED) as they watched the Grand Prix from the VIP. With 35 riders qualified for the Longines Global Champions Tour Grand Prix du Prince de Monaco Presented by Sapinda the stage was set for a thrilling climax to the 9th event of the season. There were plenty of distractions and challenges throughout Frank Rothenberger’s course as the first round delivered upsets for some and highs for those who booked their place in the jump off. A fashionable crowd were on parade along the red carpet lining the port side, with spectators pressed against the ringside to watch the stars of show jumping in action. All was set for a dazzling evening of top sport under floodlights at the incredible show ground nestled alongside Monaco’s famous port beneath the Prince’s Palace. HSH Prince Albert II of Monaco, Princess Caroline of Hanover and Charlotte Casiraghi watched from the Royal Hospitality as the first riders navigated the exceedingly technical course in the compact sand arena. Frank Rothenberger’s course required athleticism and laser-like focus from both riders and horses to have a chance to win through to the jump-off. Early on Bertram Allen (IRL) and Izzy by Picobello fell victim to the tricky ornamental gate at fence 11 with his horse running out at the delicate white and red upright. He was to be followed by other combinations, including Philipp Weishaupt and Lesson Peak 8 and Piergiorgio Bucci and Diesel, to be upset at this deceptive obstacle. Frustration was written all over Rolf Goran-Bengtsson’s (SWE) face as he picked up four faults on Oak Grove’s Carlyle at the double combination. The crowd were lifted as Jerome Guery (BEL) and Celvin pulled off a stylish round and the first clear of the night. As the competition progressed the Liverpool fence on the port side of the course trapped several combinations, including Anna Kellnerova (CZE) and Silverstone G who had been impressive up to that point. There was bitter disappointment for the top three ranked riders in the overall LGCT season ranking as Scott Brash (GBR) and Hello Mr President clipped the front pole of the Global Champions oxer for 4 faults. Ranking leader Edwina Tops-Alexander (AUS) and California ended up with an uncharacteristic 8 faults and Ben Maher (GBR) and Winning Good knocked the back rail of the final part of the Longines triple combination putting him on four faults and meaning none of the top three were in the jump off. The next clear came from Harrie Smolders (NED) on his bay gelding Cas, and the World No 1 delivered a masterclass of a round much to the delight of the spectators and VIPs. The Dutch star was quickly followed by on-form Pius Schwizer (SUI) on Chidame Z with an apparently effortless clear - the Swiss rider already notching up two wins this weekend. Denis Lynch (IRL) and RMF Bella Baloubet were next to win a place in the jump off with the 17-year-old stallion delivering a powerful 4th clear of the night. Last year’s Monaco champion Alberto Zorzi (ITA) rode Fair Light van T Heike to an emphatic clear setting up a tantalising chance of a back to back victory. The sixth clear round delivered by Shane Breen (IRL) and Ipswich van de Wolfsakker completed a formidable line up for the big prize. First to take on the tough jump-off course was Jerome Guery (BEL) but an early 4 faults and a time of 36.05s left the door wide open for the fast five behind him. Always one to watch, Harrie Smolders (NED) and Cas slipped after castle fence then had first part of Longines double combination down pushed on for a fast four 34.16s, two seconds faster than Guery’s time. Pius Schwizer went wide after Palace fence and again the first part of double combination came down, before Chidame Z also clipped the back rail of Dutta 8. Knowing a clear would win him a place on the podium Denis Lynch (IRL) took 9 strides to the Palace fence, coming home clear in 40.43s - the new leader in this high drama show down. The crowd erupted in cheers as Alberto Zorzi, last year’s winner, took a brilliantly calculated round with Fair Light van T Heike, keeping a consistent rhythm but letting the chestnut mare travel to the fences. 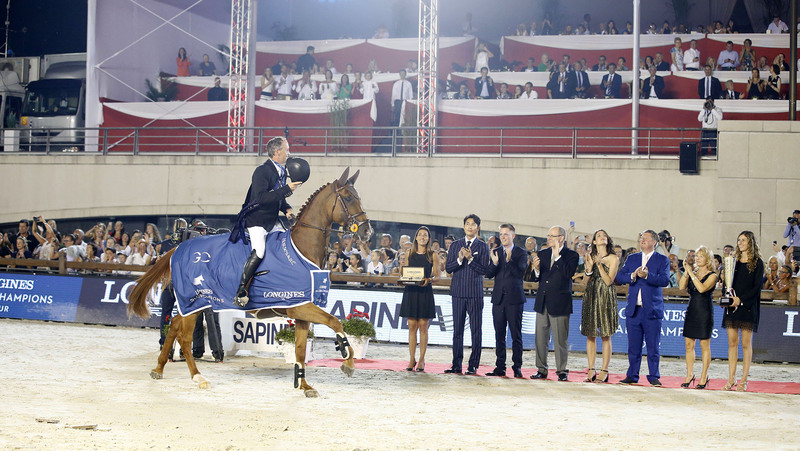 They trumped Denis’ time on 35.72s, with the potential of a back-to-back LGCT Grand Prix of Monaco win on the cards. The final rider to go Shane Breen (IRL) looked slower at the off, however managed to pick up the pace with Ipswich van de Wolfsakker, taking on the fences with all the scope and bravery required of the compact Monaco arena. The pair flew through the finish gates, stopping the clock in 35.56s, just ahead of Zorzi. This would be the biggest win of Breen’s career, and the Irishman punched the air in triumph ecstatic at his win, and place in the GC Playoffs. The Tour now looks to Paris, for the 10th leg of the 2018 Championship race as the action hots up and the race to the final rockets up a gear. Jan Tops, President and Founder LGCT: "I think the course designer did an amazing job and from 35 contenders to only have six in the jump-off is the right sort of number. Shane did an amazing job. It was tough today with the hot weather but everyone handled the course and day well." Edwina Tops-Alexander, LGCT Ranking leader: "I’m still hanging on to pole position in the LGCT. It’s a busy time of the season and you always have to have a plan for your horses. Unfortunately today wasn’t my day but the contest is getting more exciting each event with other contenders creeping up the leader’s board. We’ve got a long way to go but I’ll try and hold the boys off!" Denis Lynch, 3rd place: "I knew my horse would love the Monaco arena and within the last few months we have build a solid relationship. Because of the new partnership, today’s strategy wasn’t to go out and win it. Instead I opted to keep the poles up and get on the podium and I’m very happy with him." Alberto Zorzi, 2nd place: “I’m really happy as I continue to be successful in Monaco - this year and last year. I found the jumps very nice today. Sadly, I missed the last distance at the last fence so I knew I lost a time there but it was still a very good round." Shane Breen, 1st place: "This is my biggest career win and my first time winning at the LGCT Grand Prix. Its a great honour to be here and to be part of the GCL - it’s a great atmosphere. Ipswich is quite a green horse at this level and has had a few fences down this season. We’ve been knocking on the door but today he jumped fantastically. He was surprisingly relaxed as he can be quite sharp and has a lot of nervous energy but that was in our favour this evening in Monaco. He produced two super rounds and with Dennis leaving the door slightly open and Aberto with a fantastic quick round, the guys on the ground were saying that if I could do the same numbers my horse is naturally very quick.When I turned for number one, I didn’t have a flier at it, then I went nine strides to the second jump and I had to remind myself not to panick.I got the double jumped and moved on a bit then and fortunately when addressing the last I saw a good stride and took it! I’m now in the LGCT [Super Grand Prix] and I’m elated - it’s an elite group of riders, so I hope I can take Ipswich there again and do well."